Answering employee questions is a crucial task of any human resources (HR) group within a company. Unfortunately, a majority of those questions are similar and repeatedly asked, leaving HR teams with less time to manage more pressing employee concerns. 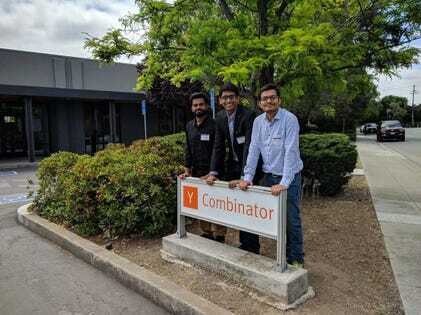 Adit Jain, 25, Mayank Goyal, 25, Anand Prajapati, 26, created Leena AI to help automate the workflow of handling ordinary employee needs to free HR groups to focus on more significant responsibilities to their companies. The New Delhi and Mountain View-based team have raised $2 million from investors like Elad Gil, Quiet Capital, Funders Club, and Cathexis Ventures. Leena AI cofounders Adit Jain (middle), Mayank Goyal (right) and Anand Prajapati (left). Frederick Daso: How did you manage to convince HR groups at Fortune 500 Companies to use a product that they perceive would ostensibly replace them? Adit Jain: Leena AI is solving a very critical problem for HR departments. If you look at HR today, people in these departments are spending their time just answering the same set of questions. With Leena AI, we want to automate that so HR people can free up their time to work on the company’s critical needs. On the other hand, it takes two to three days, sometimes even more, to get their query answered. That leads to terrible employee experience and drives a big disconnect between how expected services from HR and whether the company cares about them. A small problem for the HR department could be a massive issue for an employee. When we talk with HR directors in any of these companies, they recognize that they were in the exact same position ten years ago as their subordinates are now. The HR directors have first-hand experience of the pain of employees coming in to ask the same questions repeatedly. The pain and our ability to address it has been the single most significant factor in bringing HR groups onboard with us. Daso: Fantastic. Talking with the HR directors and convincing them that Leena AI is a tool to solve these canonical problems in human resources. How did you manage the sales process with these large firms? I know since they’re large, things move slowly and so it takes a while. Jain: Great question. My cofounders and I had any prior sales experience. Initially, we were trying to sell the solution as is. We said to potential customers that you would need to be a year’s subscription upfront and then you could start using it. Soon, we realized that our sales process wasn’t working given that we are a small company selling to enterprise customers. Instead, we engaged with pilot programs with our customers so they could test out our technology. We aimed for our solution to take less than seven days to go live so we could give them a feel of how our product works for them. The department looks at the data: how many people engage, how many questions, how many were wrong, and how much time to was saved. Here’s a fun fact: we haven’t lost a customer after doing a pilot with them. Daso: Wow. Wow. That is incredibly impressive. You guys manage to create this tool and successfully market it to HR departments in need of automating the basic questions and services that they need to address for their customers. I guess my last question for you is for college students or recent graduates who plan to work in a B2B space what would you suggest for them to sell to sales enterprise customers effectively? Jain: I think one of the biggest and the most important thing is to understand the customer’s pain point. I’m sure that they many times before, but I think that’s the single biggest factor. We can understand the pain points a lot of time because we’ve learned how to build a product to address said problem.